My favorite pre-Paleo chili recipe was a Sweet Potato/Black Bean version that I loved and heated up really well for leftovers. Hit me with your best Paleo chili recipe, please! I have always been too lazy to drain/skim the fat. I was thinking maybe tomatillo-based or jalapeno. You're probably right, though. @wjones, I'm not sure it would qualify as chili without the tomatoes or the beans! :p I do want to try something with ground beef + butternut squash + mushrooms, but I am not sure what else to throw in there to make it "chili". I have no Harris Teeter. :( I live NEAR Chicago though, so I know if I researched well enough I could find some places that have EVERYTHING. It's just driving to get to them. Sounds tasty. Do you leave the fat from the ground beef in it? Or do you use a more lean grind? I live in NC and we can get it at Harris Teeter. I think the brand is Great Plains or something like that. Maybe a store can order it for you. HT is great about that around here. Pom tomatatoes are in the carton and they are from Italy - probably equal in quality to organic canned tomatoes but without the BPA. I too want ground beef recipes! Nice and cheap. I wish I knew where to find bison! I really have to expand my shopping area. I'm sure chopped tomatoes and chopped roasted New Mexico green chiles would do you just fine. Mmmm. I can't really do the Rotel because of the sodium, but I can definitely find something similar or use fresh ingredients. I like the idea of ground lamb. I wonder if I could find it! Thank you! My husband's annual Superbowl recipe has beer and chocolate, but also about 5 kinds of beans. Zucchini is a good addition. I'd like to find the tomatoes without a lot of sodium, that's probably what I worry about most. Oooh, maybe butternut squash then, those suckers are hard and can cook forever. I obviously want to add something orange. LOL. I get the Muir Glen tomatoes from Whole Foods, one of the few items I shop for in the aisles :) I probably wouldn't use sweet potatoes because having cooked some too long a few nights ago, they basically disintegrated. Tasty, but just not what I want in a sweet potato. Sounds delish! Where do you get Muir Glen fire roasted organic tomatoes? What do you think of the possibility of throwing in some sweet potato? Or would that mess with the flavor too much? So what's YOUR recipe? ;) Thank you! I know it's probably not the traditional view, but I really prefer to use ground beef (grassfed, of course) instead of giant chunks of other beef. It's just so much easier and I'm a lazy cook. My chili is pretty paleo, so long as you're OK with tomatoes. And no beans - they're just not needed. Get a big dutch oven going on med-high heat. Throw in a slab of butter or bacon grease. Rough chop a sweet onion and put it in, let it cook down a bit and caramelize a little. Add 1-2lbs of ground beef (grass fed, of course). Let it brown and break it up into small chunks. Be sure to scrape up any browning bits and mix it in. 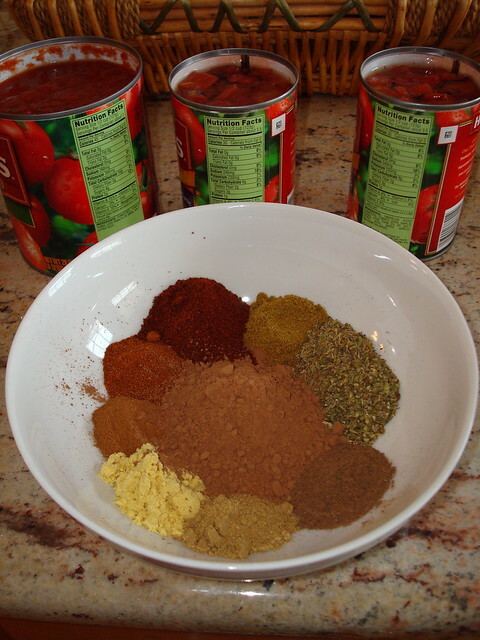 Prepare the following spices: About a tablespoon each of: oregano, thyme, dry mustard, coriander, allspice, cinnamon, paprika, cumin. Add more cinnamon and paprika if you like. About two tablespoons of: chili powder. Or more. About 4 tablespoons of: cocoa powder (not dutch processed). Or more. Dump the above all in, mix it up, reduce heat to low. Add two cans of tomatoes: 1 28oz can of crushed tomatoes, 1 28oz can of diced tomatoes. I prefer Muir Glen fire roasted organic tomatoes. Simmer for as long as you can stand it. I think all the recipes are close to paleo by default. In fact, my recipe happened to be paleo before I knew what paleo was. This is from my low carb days - pre paleo. In a big pot, put enough oil to cover the bottom. I'd use coconut oil and/or butter (back then it was canola or olive). Put to low/med and add 2 chopped onions and 3 pressed garlic cloves. Stir to prevent the garlic from burning. When the onions start to get transparent add the meat - I typically used 3-5 pounds of a mix of ground beef/pork (and sometimes turkey). Once the meat is browned, add a 15 oz can of tomato sauce and the spices. I used Sen. Goldwaters Chili Spice Mix, which is mostly chili powder and cumin. Also I add about 1/2 jar of Old El Paso pickled jalapenos after running them through the food processor. Simmer for 30 minutes to 2 hours, add salt, pepper and hot sauce (like Tobasco) to taste. Obviously a lot of canned and bottled stuff that you would probably want to substitute out. I've also used roasted jalapenos, serranos and they work great. I never make this the same twice! Other optional ingredients: beer, chocolate, cinnamon. Warning - it is very spicy! I discovered this by accident. I was purposely looking for a recipe that used diced meat because I generally have a mental block about ground meat. Separate and chop cloves of garlic, chop onions, bell peppers(I removed the seeds but you can leave them in if you want more kick) and jalapeno pepper. Heat lard and bacon grease in a Dutch oven until hot, add onions, garlic and peppers. Saut?? until onions are translucent, be careful not to burn the garlic. Remove vegetables from pan and reserve for later. Add ground beef and pork to the pan and brown over medium heat. Do not drain the meat( that?? ?s where the flavor and fat is) I like to have my meat all broken down and not in large chunks but it?? ?s a personal preference. While the meat browns open the cans of fire roasted tomatoes, do not drain them. I used our vitamix to puree the jars of tomatoes and threw in the carrots just to get them into the chili without having to deal with saut? ?ing them. After the meat has browned add the vegetables back into the pot along with both cans of tomatoes and the pureed tomatoes. Mix to combine. Add the spices and mix well. Turn down the heat and simmer for at least two hours to allow everything to meld together. Now you just have to wait. That?? ?s the hard part. My wife who is not paleo ate it and agreed this was the best chili I have ever made, even though she loves beans in her chili. I will admit that chili isn?? ?t the same without some sour cream and cheese on it. And although it is verboten I do add them occasionally. Cook a few slices of chopped bacon a few minutes until slightly brown and some of the fat is rendered out. Add a chopped onion. When they get semi-translucent, add about 4 cloves of chopped garlic. After a few more minutes add 2 lbs of ground bison and cook through until brown. Add a couple tablespoons of chili powder and a teaspoon of oregano and paprika, 1 1/2-2cups of water or beef broth and 3-4 finely chopped tomatoes (or a 14.5oz can). Cover and simmer an hour stirring occasionally. Add a tablespoon of cocoa powder and apple cider vinegar and cook for another 20 min or until it's thick enough for you. Edit: Oh yeah, you can also use ground beef, but you might have to scoop out some of the excess fat. It makes it too greasy if you don't. Melissa over at "The Clothes Make The Girl" has an AWESOME chili recipe. We've made it several times. It's pretty simple. We like to let it simmer for several hours. It calls for one beer, but if you're strict Melissa recommends substituting with one cup of water. We have done both, and the water doesn't take away from the taste. This is off the top of my head...I made it the other day and it was exceptional. Saut?? in coconut oil one chopped yellow onion, one chopped green bell pepper, and a half of so chopped yellow bell pepper. Once they start to soften, add in two finely chopped serrano or jalape? ?o peppers, five minced cloves of garlic, and a tablespoon of cumin and of chili powder, plus hefty pinch of cinnamon. Once everything is good and fragrant (after, say, two or three minutes of cooking), remove from pot and set aside. Brown a pound of ground beef and a pound of lamb in the leftover veggie grease. (You could of course use just ground beef, and if you can grind up liver, throw some of that in too, to be about 1/3 of the meat content). Return the veggies to the pan and add two cans of original Rotel and one 28 oz. can of whole tomatoes that have been pureed in the blender. Let it simmer til the flavors meld, and add salt, black pepper, and hot sauce to taste. Mark Sisson has a recipe, though I've never tried it. It's similar to the chili con carne recipe I've used from Cook's Illustrated for years, which is unfortunately behind a pay wall on their website now. As Carl_Stawicki points out, proper chili shouldn't have beans (they're a filler used to bring down the per-serving cost, just like noodles or rice in chicken soup) and is already a great paleo recipe. In the end, chili con carne is a subset of beef stew, which replaces the vegetables with tomatoes and chiles. Want a different take on the standard chili? Make a Pumpkin Turkey Chili!